Which Future Marvel Movie Could Be Set In The Past? Ever since Iron Man came out in 2008, most of Marvel’s movies have followed each other chronologically. Excluding flashbacks, the only exception so far has been 2011’s Captain America: The First Avenger, and even that caught up to the present when Steve Rogers awoke from suspended animation. ABC’s Agent Carter provided Marvel fans with another period piece, but so far there haven’t been any other movies that have taken place in the past. However, according to Marvel Studios president Kevin Feige, that may be subject to change at some point in the future. Certainly we could [set another one in the past]. There are no rules. I think the majority of them will be chronological, but not all of them necessarily. For the sake of argument, let’s assume that at least one of the already-announced Marvel movies is set in the past. Which one could it be? Although it was originally said not to be an origin story, perhaps Doctor Strange will show us how Stephen Strange studied the mystical arts a decade or so before the modern day MCU events kick off. Captain America: Civil War is introducing an established Black Panther, so maybe T’Challa’s solo movie will show how he became King of Wakanda and embraced the royal costumed identity. However, there’s one movie in particular that’s ripe to take place outside of the current timeline: Inhumans. Spoilers for Agents of S.H.I.E.L.D. Season 2 are ahead! Although their solo film doesn't hit theaters until July 12, 2019, the MCU has already started getting viewers familiar with the Inhumans through Agents of S.H.I.E.L.D. In the show’s sophomore season, one of its main characters, Skye (Chloe Bennet), was exposed to the Terrigen Mist, which awakened her Inhuman cells and gave her earthquake powers. In the season’s second half, she met others like her and learned how the Inhumans descended from a group of humans who were experimented on by the Kree thousands of years ago. Although a good portion of the MCU’s Inhumans live in the community Afterlife, many of them are spread across the globe, and those of you who saw the Season 2 finale know that their population is about to increase. Because Agents of S.H.I.E.L.D. has a good handle on what’s going on with the Inhumans in the present day, the film could very well provide background on how their society got to this point. 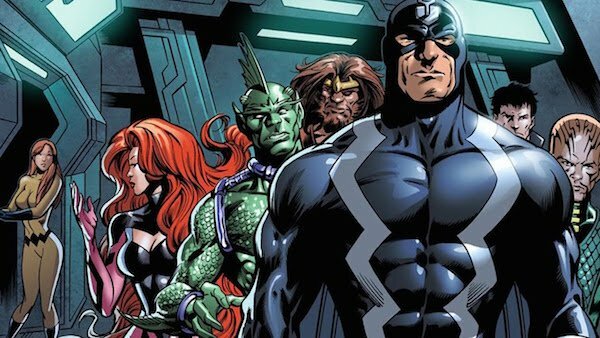 It’s a good bet that the main characters in Inhumans will be the Royal Family of Attilan, which, in the comics, consists of Black Bolt, Medusa, Gorgon, Crystal, Medusa, Karnak, Triton, Maximus the Mad, and the gigantic dog Lockjaw. Because Attilan is secluded from human society, either in a hidden area of Earth or out in space, there’s no reason it has to include any human players at all and thus frees it from the same chronological constrictions that nearly all the other movies have dealt with. Plus, considering that Inhuman technology surpasses what humans have, no matter if the movie takes several decades ago or even several centuries, we’ll still get something that’s futuristic and visually appealing. Setting Inhumans in the past also has another advantage: it gives the fans a breather. The film comes out only two months after Avengers: Infinity War Part II, which will not only see the culmination of the battle between the Marvel heroes and Thanos, but wrap up a storyline that’s been building since the MCU’s inception. It doesn’t take Sherlockian skills to deduce that Phase Four is coming, but that doesn’t mean that Marvel has to immediately follow up on its aftermath. Look at how Ant-Man is acting a buffer between Avengers: Age of Ultron and Captain America: Civil War. Inhumans can serve the same way and give fans a break from the present by giving them an exciting adventure in the past. This origin story will not only give fans a cool history lesson (that may foreshadow things happening in the present), but also familiarize people who don’t watch Agents of S.H.I.E.L.D. with the Inhumans. It’s a win-win. What do you think? Would you like to see Inhumans take place outside the present? What upcoming Marvel movie would you rather see set in the past? Let us know in the comments below.